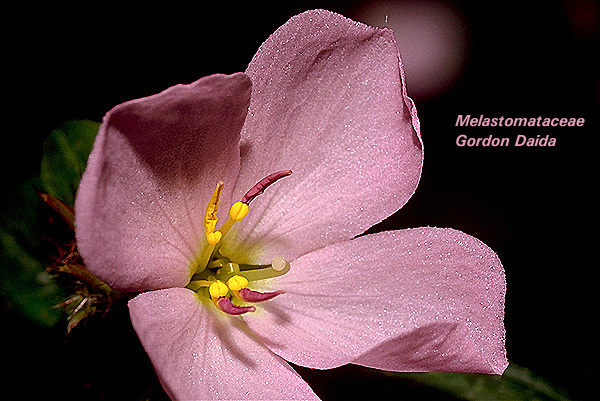 The Melastomataceae are herbs, shrubs, or trees comprising about 200 genera and 4,000 species that are further characterized by having the major leaf veins usually 3-9 palmate and running in a parallel fashion from the base of the blade to near the leaf tip. 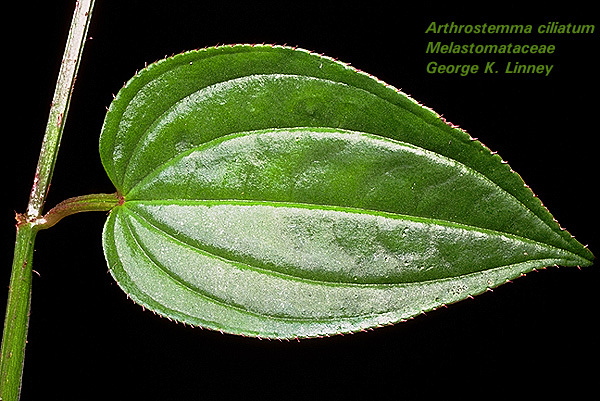 The leaves are opposite and decussate or rarely alternate by abortion of one of the members of a pair; stipules are absent. 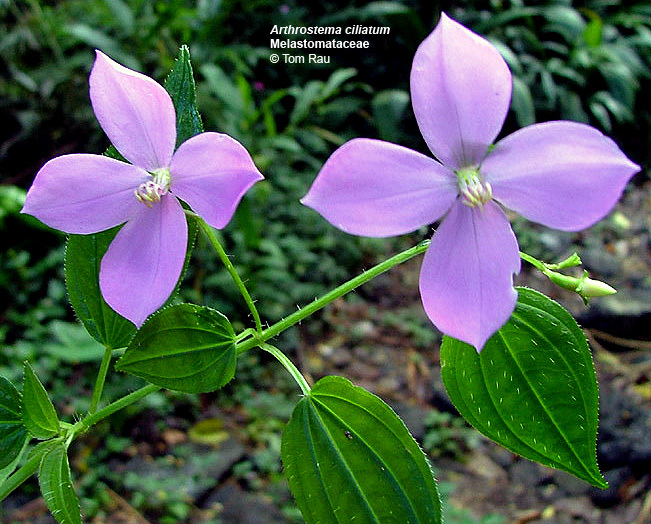 The flowers are bisexual and actinomorphic to rather zygomorphic, at least with respect to the androecium and style. The perianth is biseriate, arising from a perigynous or epigynous zone. The calyx most commonly consists of 5 valvate sepals but these may be coalesced into a hoodlike calyptra. The corolla commonly has 5 distinct petals. 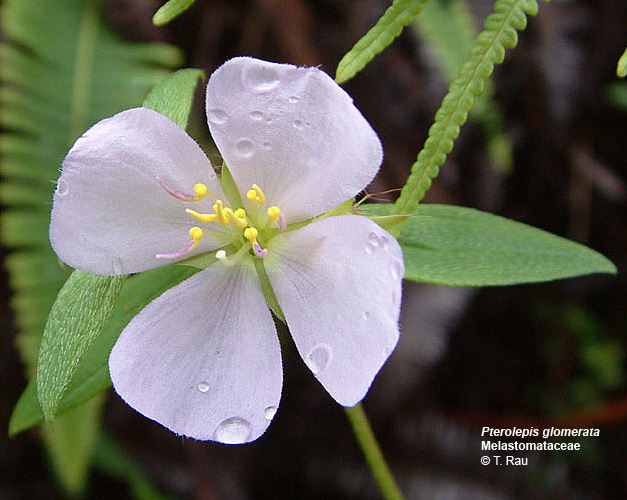 The androecium most often consist of two whorls, each with the stamens equaling the number of petals but rarely has only one whorl or numerous stamens. 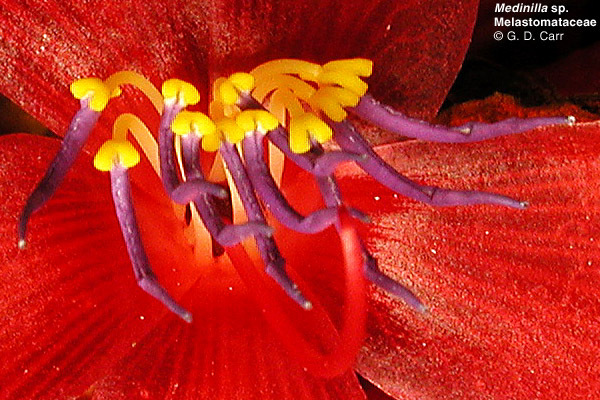 The stamens may be dimorphic but the functional ones are typically claw-like, commonly with knee-like joints and appendaged anthers that open usually by terminal pores. The gynoecium consists of a single compound pistil of mostly 4-14 carpels, a single style and stigma, and a superior or more commonly inferior ovary mostly with 4-14 locules and very numerous axile ovules. The fruit is a capsule or berry. 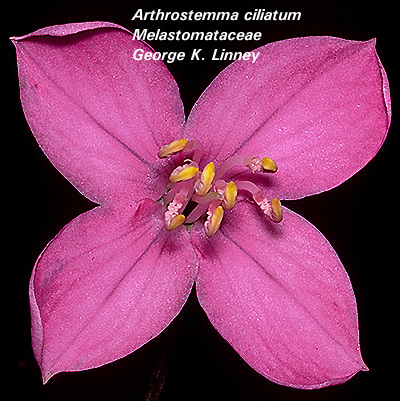 Arthrostema ciliatum. The left photo clearly shows the palmate-parallel leaf venation so charistic of the family. 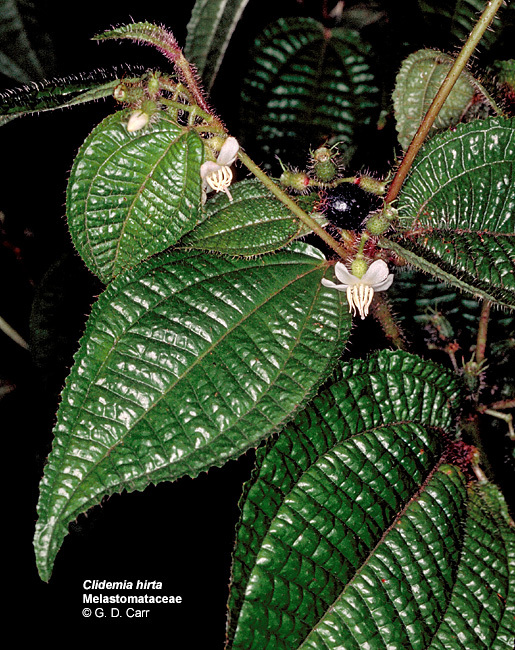 Clidemia hirta, Koster's curse. 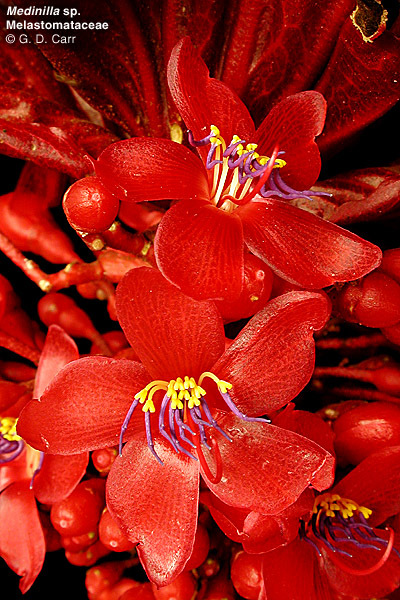 Though small and with short filaments the stamens still have the claw-like appearance typical of the family. 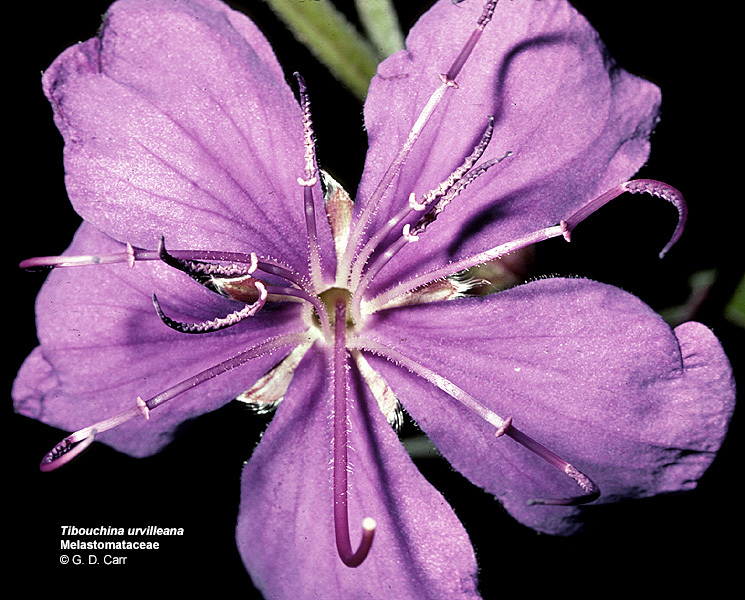 In this case the flowers are nearly actinomorphic and the ovary appears to be inferior. 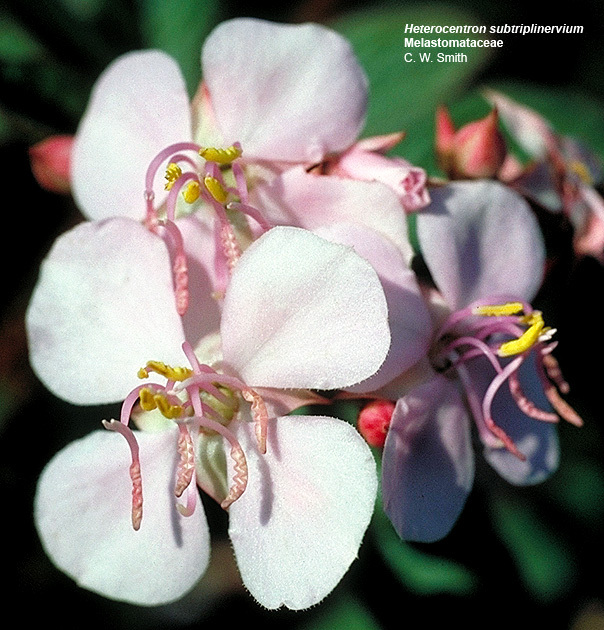 Dissotis rotundifolia. 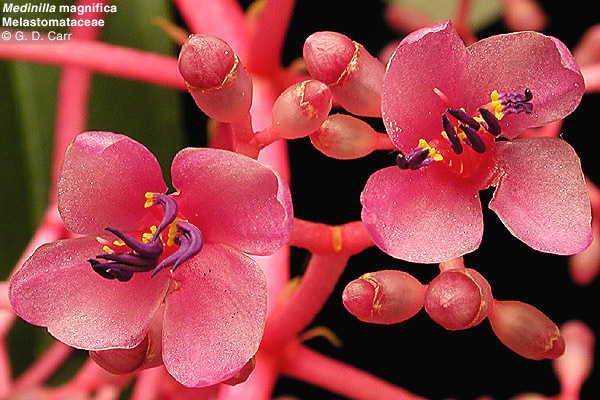 Not all of the stamens develop fully in this genus Note that the functional stamens have pink anthers with terminal pores and have a knee-like joint with a yellow appendage where the filament attaches to the connective of the anther. 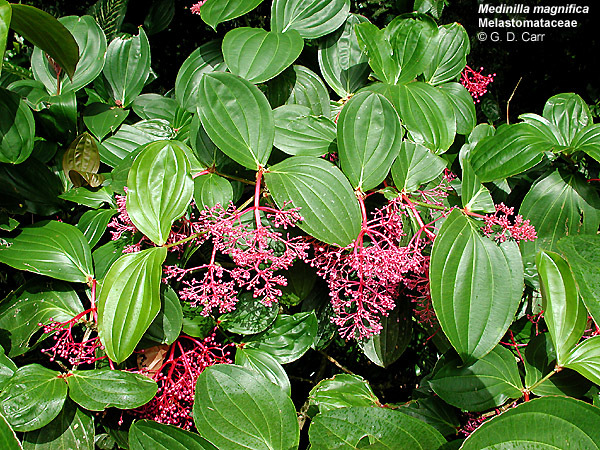 Medinilla magnifica, note claw-like anthers with terminal pores. 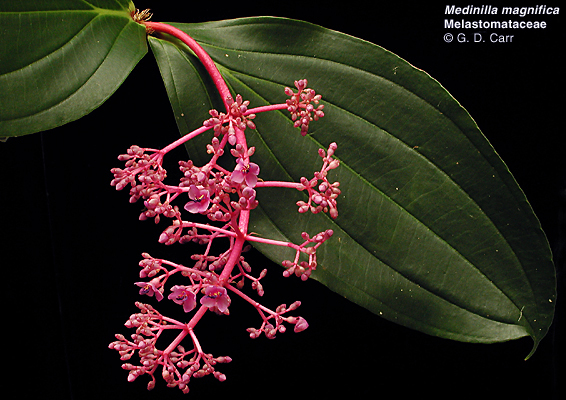 Medinilla sp., note the claw-like, appendaged anthers with terminal pores. 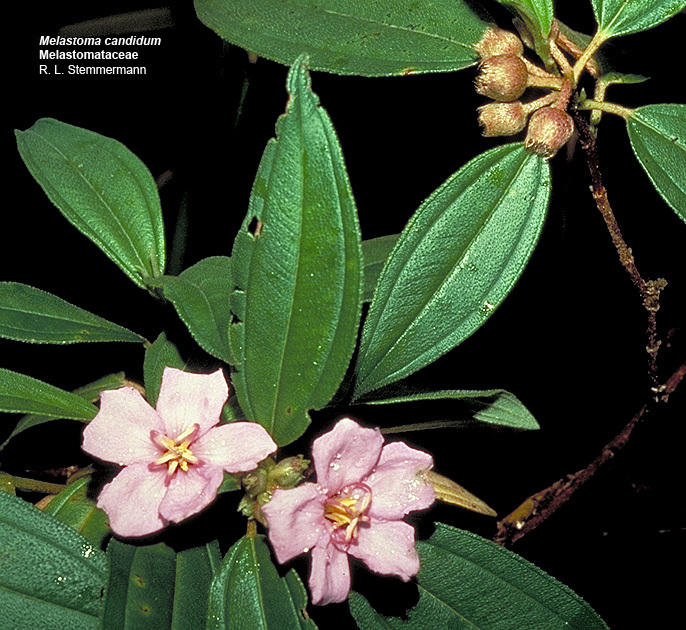 Melastoma candidum. 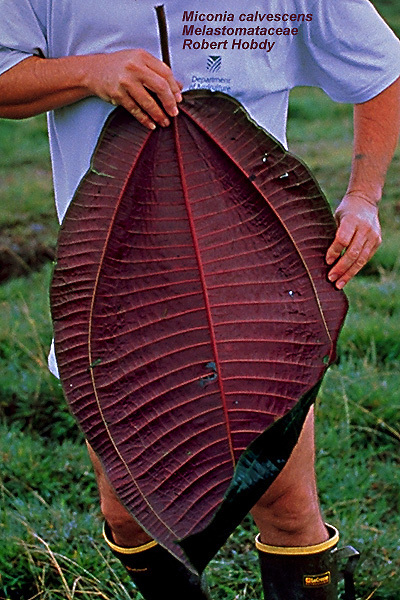 Note the leaf venation. 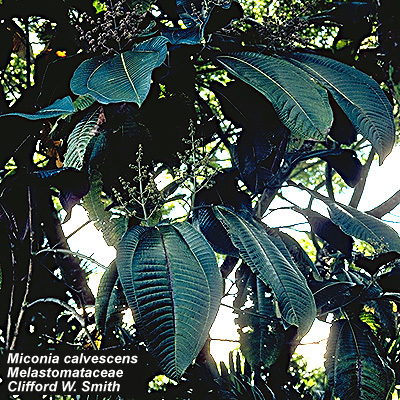 Miconia calvescens, miconia. 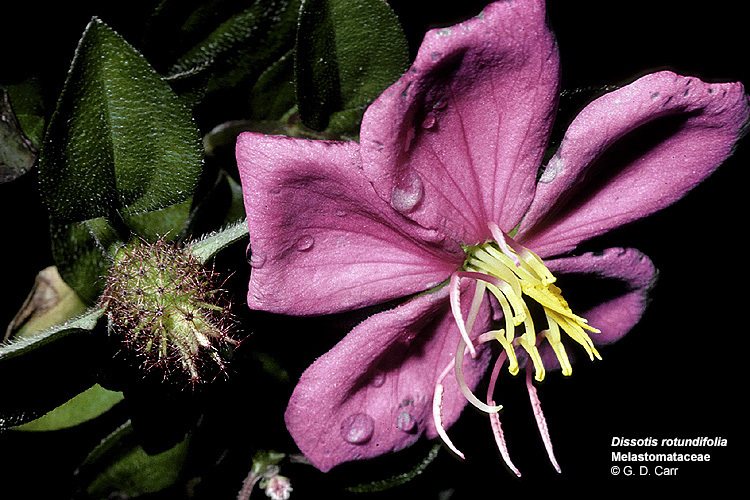 This is one of several species of Melastomataceae that threatens the native Hawaiian flora. 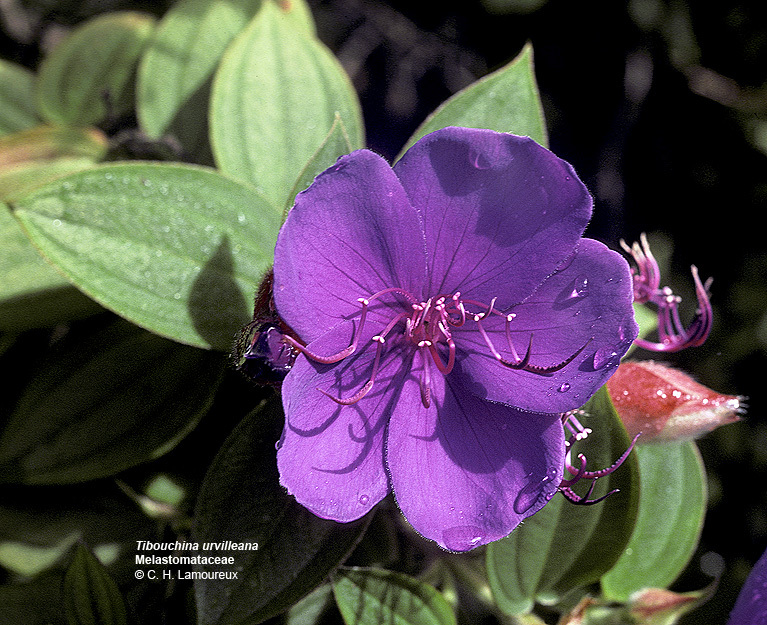 Tibouchina urvilleana, lasiandra. 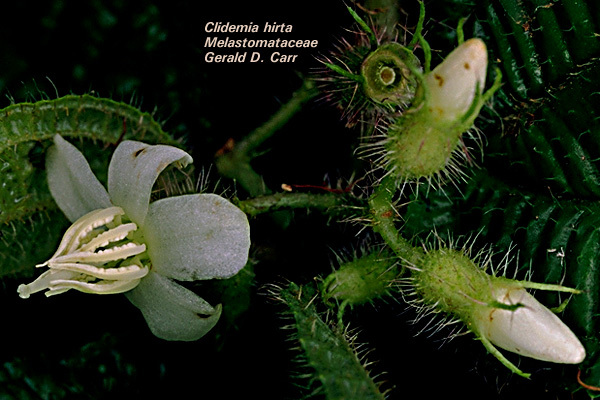 In this species the stamens all have a similar claw-like morphology. Note the conspicuous perigynous zone surrounding and extending above the ovary and giving rise to the perianth and androecium.